I made these cute Autumn napkins quickly and easily with some inexpensive cloth napkins from Walmart and the new Cricut Paper Trimmings Cartridge. Using the new Cricut Paper Trimmings cartridge, I cut leaf2 and leaf2 shift at 3” and at 3”. Iron fabric using heavy starch. Iron napkins where image will go. Then, Iron Heat ‘n Bond onto back of 8” x 8” square of green fabric and onto back of 8” x 8” square of brown fabric. Set the blade at 6, speed at 3 and pressure at 6. Multi-cut 2x. Using Cricut Paper Trimmings cartridge, cut at leaf2 shift 3” two times using the brown fabric. Cut at leaf2 shift 3” two times using green fabric. Remove paper backing. Carefully layer and and lay onto napkin. Iron on layered image to napkin. Repeat for other napkin. Do NOT over-iron as it won’t stick. Remember, this cartridge is only available to Cricut Circle Members (see here for details on the Cricut Circle - warning: not sure if this is the first cartridge you get...). 1) Leave a comment below letting me know how you store your Cricut cartridges. That's it! Winner will be announced on Monday, October 24 and will have two weeks to claim their prize. Beautiful napkins! I'm really looking forward to getting my hands on Paper Trimmings. And I've had no luck wih fabric cutting, so I'm going to have to try starching it first. Only I have to buy some starch lol. I didn't even know we could cut fabric with the Cricut! I'd love to put my hands on the Paper Trimmings and use it for my Chirstmas decorations. Thanks! Nice project. They would dress up any table setting. I just leave my cartridges in their original box and have them in alphbetical order on a shelf. There are getting to be too many so may have to figure out a new system soon! love the nakins! great wayt o decorate for holidays..
thanks for a chance on ur giveaway. Those are really cool napkins! I love the idea! I store my Cricut carts on a shelving system that I made from 50 cent shelves from a rummage sale. They are supposed to be corner shelved but I turned them sideways and the fit 12 per shelf. I love it because I can always see them! I'm going to try the napkins, thanks for sharing! Well, since I only have four cartridges, I really don't have a storage problem at the time since they are sitting on the shelf with my Cricut. Maybe one day I have more to work with - LOL! These are so pretty. I leave my cartridges in the box in alphabetical order in a drawer since i don't have room for them to be sitting out. Love this project. Six of my carts are always on my Jukebox ready for use. All the others I store in the bucket of the jukebox. My overlays and books are in a transparent box next to the Cricut and Jukebox, right at my fingertips. The Jukebox also makes a great carrier for carts when I travel. I snap the parts all together and go. Cool napkins! I don't have a lot of cartridges. So they are kept in the original box tucked in a drawer. Pretty napkins. I haven't tried fabric cutting yet. I want to make a Christmas pillow. I store my carts on a book shelf in alphabetical order. Shelf is getting full so I will be excited to read how other people store theirs. 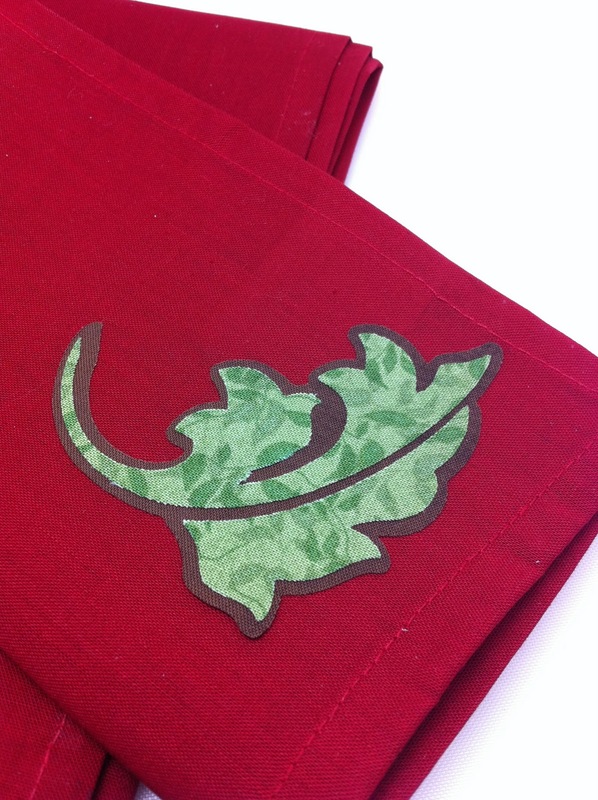 Great idea for napkins-that opens a whole new world for holiday decorating! I store my cricut cartridges in their original boxes on a wooden shelf (my husband made) above a big desk. On each side of the desk I have a 5 shelf metal shelving unit that the wooden shelf is on top of. Love your napkins. Thank you for sharing. As to how I store my cartridges, they sit on a shelf in thier original package because since I have a Gypsy I don't need to pull them out to use. Hi! Thanks for the chance to win! I store my cartridges in their boxes on a shelf above my Cricut. These napkins are lovely, Joy! I really do need to use my Cricut with fabric one of these days! I don't have a whole lot of cartridges, so I just store mine in their boxes on a shelf, in alphabetical order. Pretty napkins! I only have a few cartridges, so I store them in a little bin. Great idea with the napkins!You sure are getting into cutting fabric with the cricut, aren't you? I store my carts, booklets and overlays in folders in photo boxes. Each folder is labeled and they are in alphabetical order. Font carts in white boxes and image carts in black boxes.Works great for me! Good idea for the holidays! Have never tried cutting fabric - may just do this one! Looks like a great first try! I store my carts in their boxes. They are on my Gypsy so I don't really use them. I keep my project booklets in a bin close to my Cricut. Would love to try those new Artbin boxes but can't find them!!! Really cute, Joy! I still store my cartridges the old fashioned way, in the original boxes. I have 10 of the small square crates from WalMart that 4 boxes fit perfectly in, and they stack on each other very well. I have a lot of solutions carts as well. They go in a drawer right under where my Expression sits. Very NIce!!! Thanks for sharing! What a neat idea, would make a great gift!! All of my carts are in their original boxes but I'm quickly running out of room on my shelf so I will be researching other storage options soon. I looked at the Artbin containers at the CK convention I went to this weekend and I really liked them - so I might be going that route! HI...I store my full content Cricut Cartridges in the Black zipper Cricut Cartridge storage system they hold 12 cartridges/ea along with the books and organzie each case by theme as for my Solution and Lite cartridges I use Recollections Cricut Storage Jewel cases they hold 16 cartridges each these are found at Michael's I also organized these by theme. Joy I love your napkins they are so beautiful ...Girl you can style anything I always can't wait 2 C whatcha bring next. You are so gosh darn talented! I store my cartridges in a box, sides up so I can see the names. Wow perty napkins. I really want to try cutting fabric with my cricut. I store my carts in this craft cart that I bought at Michaels. It had three big drawers and it fits like 16 carts. Love the idea of decorating napkins!! So clever! :) I don't have very many cartridges, so I store them in their original boxes alphabetically...just in a box. I cut only with Design Studio, so don't really need access to the overlays or books very often. So... cart boxes are on a high shelf, in alpha order, but holding only the overlay and book. In the drawer under my cricut are two Flambeau boxes (same people who make Artbin) from the fishing dept that look just like those old floss storage boxes. They hold each cartridge in a separate compartment, and I can see through them to read each title. Super easy to tote with me, and 18 carts store safely in a tiny box. Now that's a great way to decorate your table - and pretty napkins are so functional too. I store my cartridges in their containers on a TV cart, where my Cricut sits. The machine sits on top, and carts, mats, and supplies like vinyl or papers are underneath. Beautiful table decorations... love it. Love the napkins !!!! I store my cartridges in their boxes on a DVD Rack. I'm hoping Santa will bring me a Gypsy then I will store them on it. Thanks for sharing your project with us and giving us the chance to win this great cartridge. I found these great snap-close containers at Michael's that are supposed to be for beading stuff. They close with 2 latches and and handle at the top, kind of like a briefcase. They have 3 rows of divided compartments. I store all my carts upright with the names written on the tops in Sharpie. Each section holds 4 cartridges. I have 2 cases full right now. I don't use my overlays anymore so I just store them away. I have the books stored in a container, but I usually look them up on my ipod and only dig one out if I'm doing a really big project with one cartridge. I really only need the actual cartridges easily accessible all the time so this works great for me and takes up little space. What a cute idea with the fabric. I see where it is easier with simpler patterns. I keep my cartridges in their original boxes on shelves that my husband just put up for me. Right above my cricut expression. I have the liters all together, the alphabets together, hello kitty, pooh, and Mickey carts together and then all of the others are alphabetical. Those are cute napkins! I store my cartridges in a cupboard thing that my dad built. I am running out of room though because I am getting too many cartridges! I made the black Halloweeen vinyl cutouts you had posted some weeks back, using my Cricut Expression and a cartridge I already have at home, Wrap it Up. You were right Melanie, about how hard they are to smooth out with the curves of the ppumpkins! Even so, I thought they looked great! You can see them on my Facebook page. Thanks for sharing your ideas for all of us! Very cool idea. Thanks for sharing. I store my cartridges on a shelf in their box. I did just buy a Cricut storage binder though to take with me when I go to a crop. Beautiful napkins! I store my booklet, overlay and cartridge in folders in a plastic box just a little bigger than a photo box. My cartridges are stored in baskets by fonts or by subject. They are decorative without having to have shelves. I store my cartridges in the new Art Bin Cricut storge containers. It was hard for me to give up the boxes, but these take up a lot less room. I love your napkins! Gonna have to try this technique! I store my Cricut cartridges in the binders they come in on the top shelf in my craft room. That is a great idea for napkins. I would like to try that. It is a great cartridge. I keep my cartridges in a plastic case. I stand them up with the title on top. It is so convenient to get when I want them. I just bought from Michael's a Recollections storage box that is perfect for about 16 cartridges and books. And I got if for half off! The napkins are great ! Uh oh ! I forgot the part about what I do with my Cartridges ! I have 2 jukeboxes full the rest I've had just stored in their boxes on the shelf. My husband just got me the new binder. I can't wait to use it !! I really like your blog. Pretty napkins! And thanks for the info on using Heat 'n Bond. I store my cartridges in a drawer in our art cart. It's a cabinet with 5 drawers where we store school supplies and arts & crafts supplies. But I managed to snag one drawer for my Cricut carts. So far so good, but I'm starting to run out of room. LOL. I have four (floor to ceiling) bookcases in my craftroom that I store my cartridges in. The cartridges are upright and I can see the labels very easy in case I need to grab one. So far, I have room for more...lol. I love your napkins...they are beautiful. I've not worked with fabric yet, but I will have to give it a try. The tip about the heat n bond is very helpful...thank you! I've tried several different ways to store my cartridges, right now they are just lined up on my shelf alphabetically. Yea, not very creative...they take up a lot of space...but I do like the fact that I can glance up and see what I need. I use 2 of the 6-pack holders and rest are in their boxes stored along back wall of the counter so I can see their names. I need to get more cartridges so it would be great to win this one. I'm already signed up for your blog post. Beautiful napkins...love it. Thanks for the idea. I store my cartridges in aphabetical order on a shelf above my Cricut. Love this idea....will be making Christmas napkins! I love the napkins. 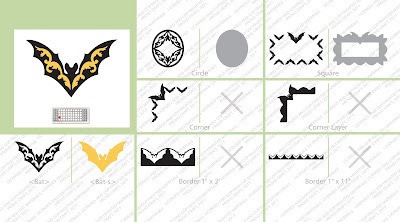 I have never thought of using my cricut for anything other than scrapbooking but think I am going to have to try with some scrap fabric I have laying around. Love your napkins. I store my Cricut cartridges in the ArtBin storage boxes, which I just switched to a few months ago. I also just got a Gypsy (only a few years behind) and see that I don't have to drag the cartridges around anymore. Thanks for the chance to win this cartridge! As of yet do not have any storage system because I have no craft room. I use the living room and my stuff though somewhat organized is still space consuming. I store my cricut cartridges on a book shelf. They are easy to grab when I need them. Great napkins. I use mine all the time. TFS! I subscribe and follow the blog. I store my cartridges in a plastic box I bought at JoAnn's. It is a "stackable" and the carts go in the bottom and the books in the top. I fit all of my cartridges in it (15) and there is so much room for more. I would LOVE the Halloween cart! Not many of the stores here carry a good selection. I love the napkins - they are beautiful! I still store my Cricut carts in their original boxes on shelves, but I have exceeded the shelf capacity so I may have to come up with something else. I have to start cutting fabric with my cricut, it looks so easy to get stunning results. I store my carts on my Gypsy :) I never even get the carts or handbooks out. Your napkins are beautiful, Joy! I might have to give this a try! I can't wait to receive my Paper Trimmings cartridge - it looks awesome! pretty napkins, Not a circlet yet, have been thinking about it. I have a shelf in my craft room that is the perfect height to fit cricut cartridges. And the shelf is deep so i can fit them three rows deep. It works for me for now. Very pretty napkins, thanks for sharing on how to make them. Right now I store my cartridges in photo boxes, but I bought the art bin case for them I just haven't move them into it yet. Love those napkins! Wow, you can do so many different things with a Cricut!! I store my cartridges in the ArtBin containers. I love that you can find the carts and their manuals easily! I put an index card on the top in each container so that I can see at a glance what's in it. I love the napkins! You're so good Cricut! Thanks!!! I store in original boxes and keep in alphabetical order. So far works out great! Great project, I need to try cutting fabric. I store my carts in the snapware containers. The shallow ones store the actual carts and the deeper ones hold the books and overlays. Works great for going to crops or working at home. Great project, mine never stick, maybe I'm over ironing, thanks for that info! I will try it again with less iron. My carts are just piled on a shelf and I can never find what I need, I need a new system! I store my cartridges in stacked plastic containers-bottom holds booklets, top holds cartridges, tools and extra blades. Super cute napkins!! I only have 3 cartridges and they fit nicely at the bottom of the box my cricut came in. Beautiful! Oh, so nice to get back into the swing of things - life has been hectic lately. My carts are on floating shelves in my craft room or in photo boxes alphabetically. Haven't gotten up the nerve to throw away the boxes yet. Cute napkins! I think I will really like this cartridge and can hardly wait to get it. love your projects! I haven't been daring enough to try to cut fabric on my cricut yet but it is on my to do list :) I store my cricut cartridges on a shelf next to my desk. I like to look at them so when I'm doing a project it reminds me what cartridges I have. thanks! I only have 40 cartridges so they store easily on a tri-level stand my husband built that sits on my desk. I love it. 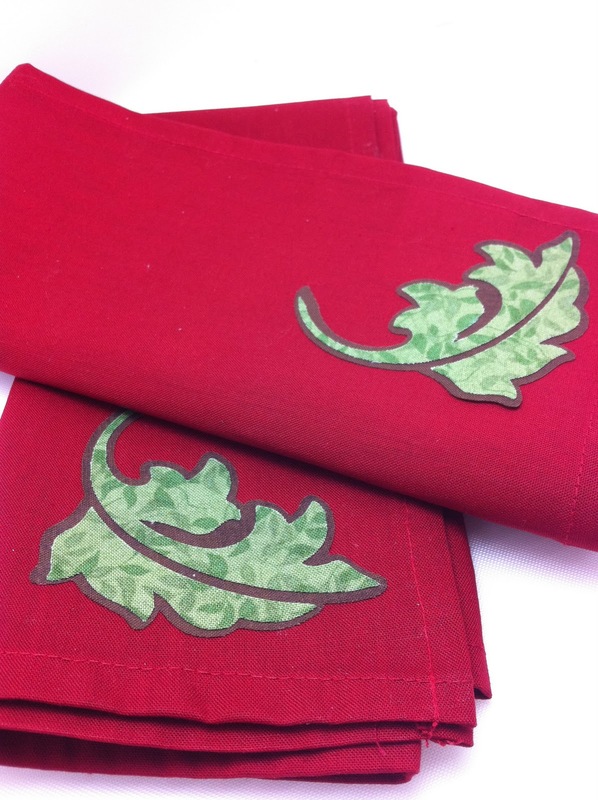 Your napkins are beautiful and would look lovely on a fall table. Lovely napkins! I have yet to try to work with fabric on my cricut, but that opens up a whole new set of project. This has to go on my must-do list. Thanks for sharing. The possibilities are endless! We have only scratched the surface of all that we can create using the Cricut! How cool is that? Because I use my Gypsy most of the time, I store my cartridges on shelves like books. They are easy to see and find if I need them. I store the ones that didn't come in a box in the Cricut boxes made to hold them and label the spines. I would love to add this give-away cartridge to my collection. Thanks for the chance to do that! Love the napkins! Is Paper Trimmings the new Cricut Circle cartridge? Or will it be available to everyone? Those napkins are gorgeous! I also love both the Fall and the Happy Hauntings cartridge images. (I love making Halloween layouts, cards, etc) I store my cartridges in their original packaging on a shelf. They are lined up the same way that books are put in a library, so I can see the titles at a glance and find what I need easily. Joy-Lovely napkins. They will add a special touch to your table. Before I had my G and over 80 cartridges I use to store my cartridges in my 3 Jukeboxes. Now I have my G, which I use ALL the time to design and cut, I link my cartridges and keep them in their boxes. I put the booklets in a purple closet box I purchase from Bed Bath & Beyond just in case I want to flip thru them. love the napkins!! love your giveaways!! love this hobby!! great idea. Thanks for sharing the steps to cutting with fabric. I as of yet have not ventured into this medium but it does look easy. Some day I will be brave enough. Your napkins are beautiful! I store my cricut cartridges on a a table beside my machine. I only have two so storage isn't really a problem yet! I subscribed to you in google reader! Love cutting fabric with the cricut. These napkins are awesome. I store my cartridges in a 3 tier turning stand that sits right next to me when I'm at my cricut. I have the booklets in alphabetical order in an open bin with large binder clips attached to the first one of a new letter and have it sticking up so I know where to go quickly. Overlays and boxes keep in a big plastic bin and store it away. I really have to try cutting fabric with my Cricut. Neat idea to try on napkins. I store all my carts in a drawer I have that is quite big and deep. Store them to I can see spine. I still store everything together, box, templates, book, etc. Great project. I store my carts in a binder from crafts contain ya. Love the napkins! Thanks for sharing. I store my cartridges/booklets/keypad overlay in the Artbin Super Satchel. Love your napkins! So pretty! I store my carts on a shelf in my scrap nook in the basement. They are linked to my Gypsy but I keep the boxes for easy storage! I love your napkins! I definitely have to try cutting fabric! I've not had the courage to do so before. You inspire me! Since I purchased my gypsy, I store all of my cartridges in their original boxes; at the very back of a closet where they do not take up much space...ha! I do, however, keep the handbook and the layout in a see thru plastic bin I got at Walmart. I keep these in an easy to reach place so I can always access them if I should need them. I love the napkins, I really like this cartridge. I have most of my cartridges linked to my Gypsy. I keep all the cartridges in their boxes on a shelf. I like to have the books for reference. Great project. I really like that idea. They would dress up any table setting. I just leave my cartridges in their original box and have them in alphabetical order on a shelf. For now it's working. What a great idea for decorative napkins not to mention a neat idea for gifts! Thanks for sharing. Beautiful napkins!Great for any table setting,they would be great for thanksgiving!Great Job! I keep all my cart.in their original boxes,they sit on my desk across the back up against the wall. I store my cartridges in there boxes on an organizer shelf! So pretty! I have a tin box that holds my carts. What a great idea! I love the napkins! This is a cartridge, that I would love to have. I store my cartridges on my Gypsy, and I have the Cricut binder for the actual cartridges themselves. It's great because it has a space for the booklets and the keypad overlays right inside the binder. I didn't know you could cut fabric with the Cricut, either! What a great tool! I love your ideas that add something special to ordinary objects. You always get my mind working to turn a plain, inexpensive object into a work of art. Organizing my cartridges is a mess! And as an organized person, it is driving me crazy! I am about to re-do my attic space into my crafting room, so I am looking for new ideas to store them. Right now, some are in their original boxes, some are strewn about my crafting counter. Thanks to everyone who has posted how they store their cartridges. You have given me some good ideas! It is great when crafters can help other crafters! I bought a rubbermaid kitchen storage shelve for $3 at a rummage sale. I have my cartrdiges double stacked on the first 2 shelves as I have 33 and then used the bottom shelves for other suppies. Love the colors for the napkins. have to try working with fabrics and cricut. Gorgeous napkin! A set of those would look lovely on a Thanksgiving or even Christmas tablescape. Joy you napkin look fabulous! I havent tried to cut fabric yet. I store my cartridges in a draw in a rolling cart so I can take them to whatever room I am crafting in. I recently got 2 of the artbin cases made for storing the cartridges. I've filled one and a bit and will be watching for a sale to get a third one. I love how they just fit in with everything else. Such beautiful napkins. I can't wait to get this new circle cartridge. WELL I STORE MY CARTS ON MY HUSBANDS DESK. LOL. THE NAPPKINS ARE REALLY NICE, THOSE WOULD BE THE KIND THAT YOU LOOK AT AND NOT USE. I really have no storage area, so I keep them in a a box. I need to make a clear storage area for my cricut supplies. The napkin is beautiful, gotta try it. I store my cartridges in their original box on an old video holder. They fit perfectly! great napkins! still havent tried cutting fabric, but want to more and more after seeing projects. thanks for the inspiration. Ooooh -- cool napkins -- and I LOVE Happy Hauntings! I keep my Cricut cartridges in a contraption I rigged out of a Snapware Ribbon storage container. In the bottom container, which is taller with a plastic rod that holds ribbon spools, I store the handbooks and keyboard layouts. In the top section, which is just tall enough for Cricut cartridges standing up, I can fit up to 40 of them. (I made a separator insert I found on the internet that's 8 sections wide by 5 sections tall, out of those plastic embroidery canvas sheets, but you could use chipboard or thick cardstock also.) It's awesome, and best of all, portable! Love the napkins, I have never tried cutting fabric. Thanks for the great idea. I love your napkins.. I want to try cutting fabric. Since I use Design Studio, I have all my cartridges stored in the DS (right now I have 4 units). The books are stored in pockets on the over the door "shoe" storage units. The boxes I have stored in a plastic container in another part of the house. I store my Cricut cartridges in a TWO small plastic storage bins. I don't have very many cartridges so my storage bins are small, but I'm slowly growing my collection, SLOWLY. I'm a current email subscriber of your blog's. Love the instructions for the napkins - and your napkins are gorgeous! The font and shape cartridges I keep in their boxes and store them on a shelf, alphabetically. Solutions cartridges are stored in a Cricut storage binder. I keep my carts in their boxes but when I am traveling, say to a crop, I take only the carts that I know that I am going to use. I have a Cricut binder that holds a dozen and I pack that thoughfully before I go. This process makes me be more organized before the crop, and usually pays off. Take the right paper, accessories, carts and tools. ...instead of the whole MaryAnn! I store my cartridges in a cartridge storage bin I got from Michael's. It stores 16 carts and their Mats and books. I only have 12 carts so it still works for me. I also have a small basket on my desk that I keep new or "go to" carts for easy access. Probably not the most efficient method of storing carts but it works for me. I made dividers using plastic canvas and placed it in a snaplid container. the bottom compartment is deeper so my books fit. and the top compartment is shorter and is perfect for my cartridges. i LOVE it! I can fit about 30 cartridges/books in the container. And it takes up as much shelf space as a shoebox. These napkins are gorgeous! Since I don't have very many cartridges, I stack them on a section of my table so that I can read the labels easily. Pretty Napkins! Right now I keep my carts in its original cart box and place them on a bookshelf. The napkins are beautiful! Who needs Kohl's!! lol (just kidding). Since my collection has grown so much this year, I've ordered some binders to store the cartridges. I will still need to find storage for the boxes in our small house, yikes!!! I never thought to decorate table napkins. What a great idea that can be used for any holiday or special occasion. What an awesome idea! Can't wait to try it out. Thanks! I keep some of them in my jukebox(s). Other than that I need ideas, too! Love your project! First, I have to say I love this idea! Thank you so much for including the exact settings we should cut at!!! As for cartridge storage, I have an old Mary K bag that I got somewhere that zips closed and is square, I store mine in that! I use my Gypsy so I don't have to get them out and I know their stored properly. Dark and cool in the bag!!! Happy Halloween!! Great napkin idea. I must get the courage to cut fabric with my Cricut this holiday season. Inspiring napkin project. Lovely napking. Beautiful work. I store my cartriges in the cricut binders. Love the napkins, they are lovely. I have gypsy that my cartridges are on. I then have them in a plastic bin under my work bench. I only have a few cartridges so I'm storing mine in a clear plastic shoe box. I have one (Art Philosophy) that lives in my Cricut E2! Beautiful napkins! I use the Artbin cartridge storage box - a real space saver! Thanks for the oppertunity to win this cool cartridge. The napkins are a great idea. I want to do some fall & holiday sweatshirts using my cricut & fabric. I have my cartridges divided up. All my alphabet cartridges are in an ArtBin cartridge storage case, all my holiday cartridges are in a cricut cartridge storage binder and the rest of my cartridges are stored in a Cgull cricut cartridge tote bag in alphabetical order with the books & keypads in alphabetical order in ziplock bags in the middle of the case...weird, huh. Makes it rough when I get new ones and have to move them all. Of course, they are also all on my gypsy. Wow! I didn't know that you could cut cloth with the cricut machines. Now there are so many ideas running through my head. Thanks! Great posting. I store my carts in alphabetical order in 2 drawers behind where I sit at my desk. I am almost at the point of having to go to a 3rd drawer which will mean a major renovation project because I use up all the space I have. I guess I could prevent that if I stopped buying carts. Never happen!! Thanks for the chance to win one I don't have. My cricut cartridges get stored alphabetically on a bookcase. Thanks for the chance to win the cartridge - it looks great! What lovely napkins! They turned out wonderfully for you! I store my Cricut cartridges on a bookshelf - and they are all in alphabetical order. I store my cartridges in an Art Bin cartridge container. Thanks for the opportunity to win such a cool cart. Beautiful napkins! I use 3 Juke Boxes and the extra carts go in a 13 x 13 drawer in a rolling cart, alphabetized with their booklets and keypads. The cart is next to my Expression which sits on a desk top with the Jukes & pc. I still haven't mustered the nerve to cut fabric. Although, you and Melanie are certainly doing your best to push me over the hump! Currently, I store my cart in their original boxes. These are kept in the drawers of a freebie desk in my craft area. Beautiful napkins! What a great gift idea. I store my cartridges in their original box on shelves. I am getting to many so I will have to come up with another solution. I don't have that many cartridges; mine are in a box for right now in the original boxes. I just love this new cartridge! Love the napkin idea. Would make a nice gift for someone. I love this idea. Great Christmas gifts. and soooo easy. thanks. Thank you for the instructions on the cutting with material. Love your napkins! Love the napkins. I store my Cricut cartridges in the ArtBin electronic cartridge storage satchel. I really like it. LOVE the napkins...oh the possibilities are endless with cricut! Thanks for sharing. I store my cartridges in one of those special 12x12 cartridge/book boxes. Such a wonderful project, thanks so much for the chance to win! these are so pretty, what a great way to decorate a plain napkin!!!!!! 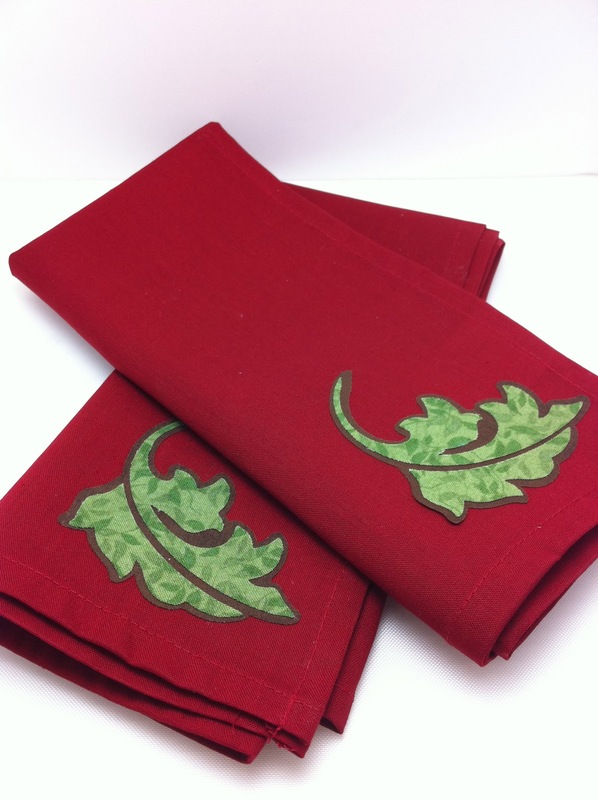 I love using cloth napkins and these are perfect for the holidays. I love your creations. You are very talented. I really love the napkins. I've been nervous about trying to cut fabric, but with the holiday dinners right around the corner, I may have to give it a try. 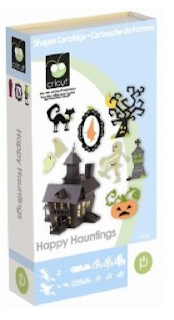 Would love the Happy Haunting'ss cartridge! I leave everything in each box with a quick list what is on each cartridge. What a quick & easy project! Adorable napkins - TFS! Hi Joy! I had not been brave to make appliques yet, but these napkins are inspiring. They look easy enough and really will have an impact on my holiday table. Thanks for the idea! Thanks for the fun giveaway! I like keeping my cartridges in the original boxes. I just store them on a shelf in my craft room but I am definitely running out of space! I love seeing everyone else's ideas for storage too. My cartridges are in a bag designed to hold them in the outside pockets with the books inside the bag. Works ok I guess but I think I've found some better solutions I'd like to try. Thanks for the chance to win! I store them at JoAnn's! 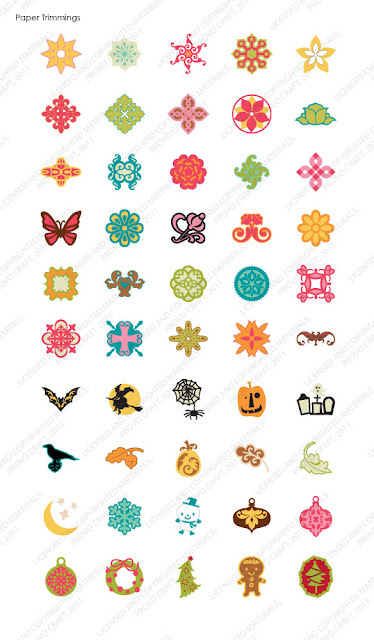 I have yet to buy my Cricut, having become addicted at a recent crop, I am living for Black Friday this year! love this, thanks for instructions. Cute napkins - I would be scared to use them ... I have shelves under my crafting table that I store all of my cartridges on in their org. boxes in alpha order. Love the idea for napkins. Thanks for sharing. I LOVE this new cartridge it is on my wish list! Beautiful napkins. I don't have much luck with cutting fabric though. I just use my cricut to draw the pattern and then do it the old fashion way with the adhesive paper. I store my cartridges like books on a shelf. You make it look so easy. And endless possibilities! Thanks for sharing. And storing cartridges? Mine are alphabetized in a big box, not too handy yet, but I know where they are when I need them until my work area gets set up. Thanks for the ideas. I keep my Cricut carts in their boxes in a bin in my smaller Expedit unit along with my other Cricut supplies. I store my cartridges in their orig. boxes on a shelf in my craft room. But I've made room to STORE MORE IN THE SAME SPACE. By putting lables on the bottom of the box I can lay them down, which uses only 1/2 the height, and I can still find the one I want.